Kress Pavilion New Year’s Eve Party. Photo by Artemis Photography. 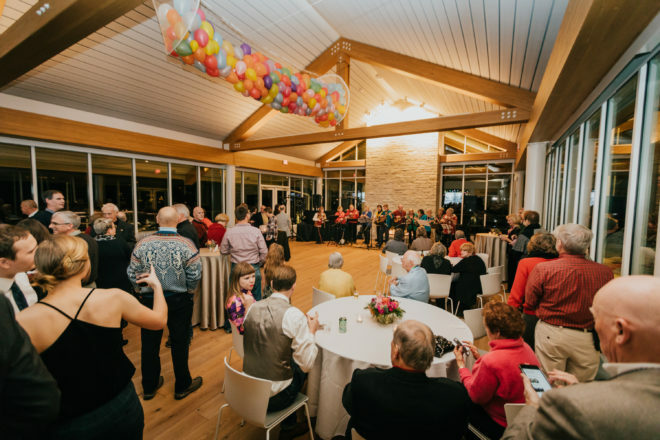 On Dec. 31, the Friends of the Kress Pavilion will host its second annual New Year’s Eve Party. The event is aimed to raise funds for the 100+ free programs that take place throughout the year. The evening will begin with live piano covers by Fran the Piano Man and a wide array of heavy appetizers. A balloon drop and kids’ countdown starts at 10 pm, and then the night will give way to a dance party led by a vinyl-record-only DJ, finishing off with a champagne toast at midnight for the official countdown. Attendees can also enjoy a library-wide scavenger hunt and try their luck to ring a bottle at the wine and beer toss. In addition to beer, wine and bubbly, guests can enjoy an Italian soda bar. For those wishing to chill out, Kress board games will be available to enjoy in the living room, and ongoing activities will be available in the makerspace. The evening’s festivities run from 7 pm to 12:30 am. Tickets are $50 and include admission, food, beer, wine, bubbly and non-alcoholic beverages. For more information and to buy tickets, visit kresspavilion.org.